Abstract: This article is a brief philosophical, historical and scientific perspective on the remarkable relationships between the anemone and the balance that reveal surprising connections between Weber's law, sensory desensitization, receptor desensitization, pharmacology, and the underlying biological, chemical and physical equilibria. Watching sea anemones as they extend and contract their tentacles in the rhythmic currents of the ocean one is reminded of the ancient Greek myth about the wind flower that blossoms and dies upon the wind (anemone Gk: lit. daughter of the wind). Curiously, there is much more to this beautiful story of the anemone than this description from ancient Greek myth. When small amounts of protein are present in the water, the anemone senses the protein and extends its tentacles to feed. However, when the amount of protein in the water is large, the anemone doesn't extend its tentacles. This is an example of what pharmacologists and physiologists call desensitization1-12. Very much like the wind flower, desensitization is the decay of the response even in the presence of continuous stimulation. Today we know that these behaviors arise from the signals sent by exogenous molecules to a set of surface molecules called receptors. However, it remains a mystery how the chemical perturbation of receptor equilibrium can produce these opposing responses often within an extremely short time2,4,7,10-12. Archimedes (c. 287-212 BC), discovered the predictable behavior of several physical systems including the simple balance. Since at least one of his notebooks may be missing, we can state that the ancient Greeks may have understood several things about equilibrium that we never received through the ages. However, their contributions remain as important as ever for the checks they provide on our sometimes too rapid intuition that can often lead us to err. Take for example the following gedanken experiment with a simple two-pan balance in an initial horizontal equilibrium. Add just enough weight to one pan of the balance so that the pan touches the surface of the table. Now add two additional weights that are equal but one hundred times larger to each pan. What happens to the balance when these two large weights are added to both sides? This is a simple problem, but it also shows our biases when we rely on intuition and forego scientific measurement and inquiry. When the large weights are added, the pan that was touching the surface of the table will rise off of the table. Fig. 1 The diagram shows a simple two-pan balance with two weights, S2 > S1 on each side. The distance of the balance arm is "r" and the tilt angle is . where r is the length of the balance arms, S1 and S2 are the weights on each side of the balance, and Mb is the total weight of the balance arms and pans. It can be seen from this equation that by adding more weight to the balance, the angle will be less for the same difference in weight. Can this equation for a balance be related to the desensitization of the sensory responses of the anemone? In order to answer this question we must delve deeper into the realms of chemical and physical equilibria. Understanding the perturbations of either a balance or cellular signalling network requires that we consider the underlying physical and molecular interactions that produce these perturbations. Pharmacology has yet to discover optimal methods that can characterize these changes that are produced in receptor systems13. Therefore, let's examine more closely the basic links between the two states of a cellular receptor as a miniature chemical balance and the equilibrium of a physical balance. As shown in Figure 2, the two states of a receptor are analogous to the two sides of a simple balance. Fig. 2 A diagram of the correspondence between a physical balance and a two-state chemical equilibrium. In pharmacology, it is generally accepted that a receptor in two-states, R1 and R2, senses a hormone or drug molecule by the selective binding of that molecule to the higher affinity state of the receptor13. This perturbs the initial receptor equilibrium and produces a shift very similar to the tilt as a response to unequal weights on a balance. How sensory systems respond to perturbations in their equilibria requires a brief discussion of selective historical and scientific relationships between chemical equilibrium, sensory perception and a balance that will provide additional perspective and further clarify these problems. Ironically in 1784, Laplace suggested that gravitational physics would eventually explain the laws governing chemical interactions14. Laplace focused on gravitational attraction as analogous to chemical attraction, not yet knowing about equilibrium and the law of mass action. In 1800, Berthollet published his observations on Lake Natron in Egypt; thereby, explaining the law of mass action15. Later, LeChatlier (1850-1936) taught that stress applied to systems in equilibrium will produce changes to relieve the stress. The changes that relieve the stress arise naturally from the perturbations to the initial equilibrium conditions. It has been difficult to quantify these perturbations primarily because we've been unable to characterize the equilibrium constant or reaction quotient with enough precision. A chemical equilibrium may be composed of many additional equilibria that we either don't recognize or choose to ignore in order to write expressions that we can easily manipulate and understand. Like the many tentacles of the anemone, a chemical equilibrium may have multiple ministates in separate equilibria within the overall equilibrium constant. Normally we never concern ourselves with these ministates unless we disturb these underlying equilibria to an extent that perturbs the overall equilibrium constant. These changes may require a deeper understanding of how the underlying equilibria interact and combine with each ministate within the overall equilibrium. This raises a much more complicated question than we can discuss here; however, we can study such chemical perturbations in more accessible systems that are more tightly controlled. Ironically, the membrane-embedded, cellular receptor may be a more ideal system for us to witness these chemical perturbations directly. From a chemical perspective, the changes in competing ministate equilibria are minimized and contrasted with the changes that produce the observable biological responses. These biological responses are largely sensory responses that selectively arose from billions of years of evolution to produce specific and rapid responses to environmental stimuli. Therefore knowing more about these sensory responses may uncover a basic understanding of the underlying chemical perturbations that produce these receptor responses. From a scientific and historical perspective, these sensory functions relay information about the environment through cellular receptors that obey Weber's law16-20. In 1834, the anatomist and physiologist E. H. Weber studied the senses and the responses of humans to physical stimuli. He discovered that at least a 5% difference in weight was required in order for people to tell the difference between unequal weights. If the weight was 100 grams, then he had to add 5 grams, in order for people to sense that one weight was larger than the other. This law gained wide recognition when it was discovered that all of our sensory perceptions also follow this law16-19. The underlying basis for this law hasn't been clearly understood. 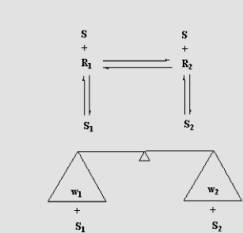 where w1 and w2 represent the weights on each side of a simple, two-pan balance and S1 and S2 represent the weights added to each side (see Figure 2)20. This equation unlike equation (1) is derived from an alternative approach that measures the equivalent perturbations in the equilibrium of a balance20. It represents a fundamental equation of physical equilibrium. The application of Equation (2) to the chemical equilibria of the senses and receptors can be further derived and refined as demonstrated below. As outlined in Figure 2, Equation (3) is an expression to calculate an equivalent perturbation in the equilibrium between states, R1 and R2, due to the unequal binding, K1 does not equal K2, by a molecule, S. This provides an alternative way to calculate chemical perturbations in two-state equilibria in terms of competing reaction quotients, K1 and K221,22. This expression also links the perturbation or shift of the equilibrium between two receptor states and a balance, and avoids the complications of combining reaction quotients into an overall equilibrium constant as suggested above. Previously, an equation that is the same as Equation (3), but derived differently (see Equation  in reference 21), was extensively tested. These tests demonstrated the robustness of Equation (3) for modelling pharmacological drug-receptor systems with explicit biophysical parameters21,22. Because Equation (3) was derived with basic physical principles, it represents a new and important understanding regarding the perturbations within two-state systems. Equation (3) also provides the glue to understand how many of the disparate observations stated above are linked to receptor equilibrium and Weber's law through the chemical, biological and physical realms. While receptor response and Weber's law have been linked, the blunting of receptor or sensory response due to desensitization has not been previously described by Weber's law. However, the fact that the slopes of desensitized responses are often symmetric to the active side of dose-response curves suggests that the desensitized side of dose-response curves also obey Weber's law. By this argument of symmetry, the response that "blossoms and dies upon the wind" offers a more explicit understanding for Weber's law and receptor equilibrium as two sides of the same coin. Remarkably, all three equations (1-3) show desensitization if Langmuir binding conditions are imposed on S1 and S2 for the above equations (1-2). Equation (3) already has the Langmuir binding conditions contained within it and therefore models desensitization very well21. Desensitization is therefore understandable as the diminution of the difference between two competing (K1 does not equal K2), Langmuir-binding isotherms for each receptor state. As the binding increases with increasing concentrations of molecules the difference between the high and low affinity states increases to a maximum value and then declines toward baseline. This provides a direct proof for the argument of symmetry, which was used above, and provides a physical basis for linking together Weber's law and receptor desensitization. Desensitization is found in many unusual and amazing places - the anemone, our senses, drug receptors, a balance and the neurochemical synapses within our brains1-12,21,22. It provides a thematic link between the physical, chemical and biological realms for the modelling of these and similar systems linked by two-state, equilibria. In the sensory world, this approach offers an explanation for the link between biological sensory-receptors, Weber's law, receptor-chemical equilibrium, and a balance; thereby explaining observations from the biological to the chemical and physical realms. 1. C. S. Pao and J. L. Benovic, Phosphorylation-independent desensitization of G protein-coupled receptors? Sciences STKE http://www.stke.org/cgi/content/full/ sigtrans;2002/153/pe42 (2002). 2. M. T. Bianchi, K. F. Haas, and R. L. Macdonald, Structural Determinants of Fast Desensitization and Desensitization���Deactivation Coupling in GABAA Receptors, J. Neurosci. 21, 1127���1136 (2001). 3. N. R. Sullivan Hanley and J. G. Hensler, Mechanisms of Ligand-Induced Desensitization of the 5-Hydroxytryptamine2A Receptor, JPET 300, 468���477 (2002). 4. K. M. Partin, Domain Interactions Regulating AMPA Receptor Desensitization, J. Neurosci. 21, 1939���1948 (2001). 5. M. He, T. Koshimizu, M. Tomic�� and S. S. Stojilkovic, Purinergic P2X2 Receptor Desensitization Depends on Coupling between Ectodomain and C-Terminal Domain, Mol. Pharm. 62, 1187���1197 (2002). 6. B. January, A. Seibold, B. Whaley, R. W. Hipkin, D. Lin, A. Schonbrunn, R. Barber, and R. B. Clark, b2-Adrenergic Receptor Desensitization, Internalization, and Phosphorylation in Response to Full and Partial Agonists, JBC 272, 23871���23879 (1997). 7. K. Bender, M. Wellner-Kienitz, A. Inanobe, T. Meyer,Y. Kurachi, and L. Pott, Overexpression of Monomeric and Multimeric GIRK4 Subunits in Rat Atrial Myocytes Removes Fast Desensitization and Reduces Inward Rectification of Muscarinic K1 Current (IK(ACh)) Evidence for Functional Homomeric GIRK4 Channels, JBC 276, 28873-28880 (2001). 8. C. Blanchet and C. L��scher, Desensitization of m-opioid receptor-evoked potassium currents: Initiation at the receptor, expression at the effector, PNAS 99, 4674���4679 (2002). 9. M. B��nemann, K. B. Lee, R. Pals-Rylaarsdam, A. G. Roseberry and M. M. Hosey, Desensitization of G-Protein���Coupled Receptors in the Cardiovascular System, Annu. Rev. Physiol. 61, 169���92 (1999). 10. J. S. Marchant and C. W. Taylor, Rapid Activation and Partial Inactivation of Inositol Trisphophate Receptors by Inositol Trisphosphate, Biochemistry 37, 11524-11533 (1998). 11. M.V. Jones and G.L. Westbrook, The impact of receptor desensitization on fast synaptic transmission, Trends in Neurosciences 19, 96-112 (1996). 12. B. Sakmann, Elementary Steps in Synaptic Transmission Revealed by Currents through Single Ion Channels, Neuron 8, 613-629 (1992). 13. L. Rubenstein and R. Lanzara, Activation of G Protein-Coupled Receptors Entails Cysteine Modulation of Agonist Binding, J Mol. Struct. (Theochem) 430, 57-71 (1998). 14. R. S. Root-Bernstein, Discovering (Harvard U. Press, Cambridge, 1989). 15. C. L. Berthollet, Observations sur le Natron, J. de Physique 51, 5-9 (1800). 16. H. Hatze, A Teleological Explanation of Weber's Law and the Motor Unit Size Law, Bulletin of Mathematical Biology 41, 407-425 (1979). 17. S. M. Dawis, A molecular basis for Weber's law, Visual Neuroscience 7, 285-320 (1991). 18. E. Batschelet, Introduction to Mathematics for Life Scientists (Springer-Verlag, New York, 1979). 19. S. .S. Stevens, Neural events and the psychophysical law, Science 170, 1043-1050 (1970). 20. R. Lanzara, Weber's Law Modeled by the Mathematical Description of a Beam Balance, Mathematical Biosciences 122, 89-94 (1994). 21. R. Lanzara, A Method for determining drug compositions to prevent desensitization of cellular receptors, United States Patent 5,597,699 (Jan. 28, 1997). 22. R. Lanzara, A Novel Biophysical Model for Receptor Response, Canadian Journal of Physiology and Pharmacology 72, 559a (1994).